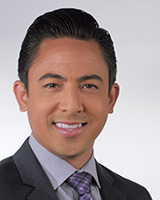 Tony Cabrera co-anchors Action News AM Live from 4:30-7am and Action News Midday from 11am-noon. He first appeared on ABC30 as a correspondent for the nationally syndicated show, "On The Red Carpet." There, he covered the day's top entertainment news stories for Action News Live at 4 and was also featured on the weekly OTRC show. Tony interviewed some of Hollywood's biggest celebrities, including Tom Cruise, Angelina Jolie and Brad Pitt. Tony's television career spans more than a decade. He most recently worked in Santa Barbara where he was a morning news anchor at KCOY-12 and FOX-11. His first on-air job was in Toledo, Ohio, then Tucson, Arizona. He started with internships at Dateline NBC and ABC News in Los Angeles. He was born and raised in San Jose, and grew up visiting family in Reedley and Dinuba. In fact, his Great Grandfather was the Mayor of Dinuba in the 1960s! Tony graduated with a Broadcast Journalism degree from the University of Southern California. He and his wife enjoy exploring the valley with their two kids. You might not think much about your car's headlights, until they burn out or appear less bright as your car gets older. Outraged over the price of printer ink? You're not alone. Consumer Watch: When are sales too good to be true? Going shopping on Black Friday? Well, here's what you need to know about sales that might be too good to be true.